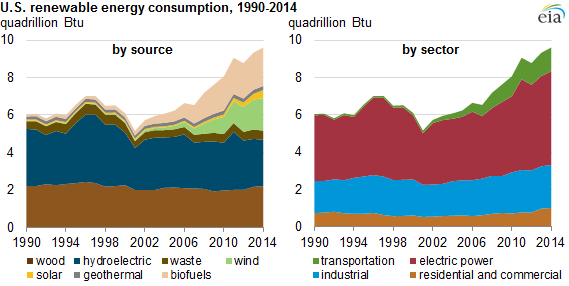 Note: Sector shares represent the renewable share of primary energy consumed in the sector. The industrial sector used 24% of the nation's renewable energy in 2014. Nearly all of that renewable energy was biomass, which included wood, waste, and biofuels used in manufacturing processes as well as in the production of heat and power. The production of biofuels results in energy losses and co-products, which are also included in industrial consumption of renewables. About 13% of the renewable energy used in the United States is now consumed in the transportation sector, which experienced the largest percentage growth in renewable consumption from 2001 to 2014. The growing demand for liquid biofuels, including both ethanol and biodiesel, pushed renewables to nearly 5% of the sector's energy consumption in 2014.